Ductless heating systems (commonly referred to as ductless mini splits) are a heat pump system that doesn’t rely on ductwork. While there isn’t necessarily a problem with ductwork, it’s been a trusted system that heats and cools homes for decades, ductwork can really decrease the efficacy of your heating system. Dirty, blocked, or damaged ductwork can decrease the efficiency of your heating system by around 30%. A ductless heating system uses individual air handlers installed throughout your home rather than a centralized unit. They can heat and cool and provide personalized temperature control to individual rooms in your home. 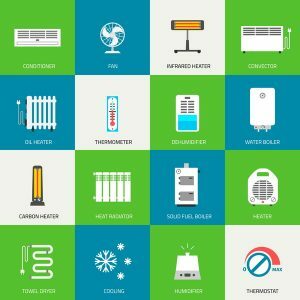 So what are the benefits of ductless heating? Flexible Heating and Cooling: Ductless heating systems are incredibly flexible. If you need more heating power in your downstairs bedroom, a unit can be installed in that room and installed almost anywhere along the wall. Money Saving: Ductless heating or cooling systems use substantially less energy in your home. Your bills start to drop dramatically. If you switch to a ductless system from a central heating system you can save 20-30% per month by switching to a ductless mini split system. Better Comfort: Some areas of your home are naturally predisposed to remaining a little hot or running cold. If you need more fine-tuned heating for these spaces, try ductless heating. Ductless heating doesn’t have to work alone, it can be used as supplemental heating for these spaces. Higher IAQ: The quality of the air in your home is another important factor in the comfort of your home. If you have poor air quality it diminishes the quality of your home’s wooden furnishings, your health, and your overall comfort. Most traditional systems that use ducts only encourage these problems and need regular cleaning for them to remain clean. Eliminating the use of your ducts all together can greatly improve the indoor air quality in your home. You can trust our team with all your ductless heating needs no matter what they are. Ductless systems aren’t always the right match for everyone so before you make the jump contact our team to determine if this is a good match for the needs of your home here in Vancouver. If you’re interested in installing a ductless heating system in your home this winter then contact our team at Area Heating and Cooling, Inc. today.